I love to design and make elaborate cards. They’re my favorite. I have several of the cards I’ve made hanging on my craft room wall right across from my workstation. Not because I like to admire my own work or anything but because I like to have something physical to look at that reminds me of different techniques — kind of like a real-life Pinterest board, except I actually *did* get around to making them (unlike all those recipes I always intend to make THIS WEEK). Anyway, my inspiration wall seriously lacks simple cards. I have a few up there, but they are way under-represented. So I’m making an effort. One, I want to start offering simple card classes for crafters who don’t have a lot of time to sit and make cards or who feel overwhelmed by lots of layers and embellishments. 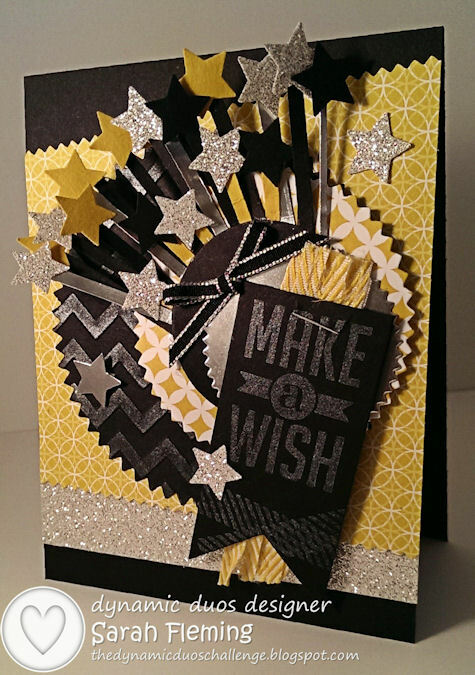 Two… simple cards don’t take hours to make or design! I started with a Soft Sky card base. I stamped three different leaves (aren’t they gorgeous?) 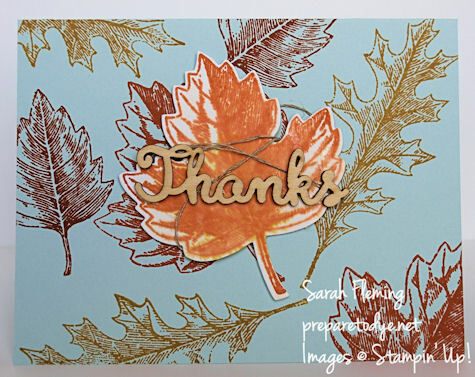 from the Vintage Leaves photopolymer set in three different colors — Tangelo Twist, Cajun Craze, and Delightful Dijon. 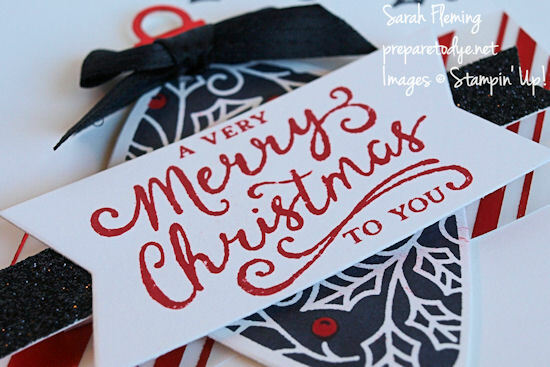 To make the card even simpler, you could stamp all the leaves in one color and could even use only one leaf stamp. As is, the stamping on this card is fast. I stamped the embellished leaf in Tangelo Twist on Thick Whisper White cardstock, then cut it out with the Leaflets framelits. Then I spritzed it with water using my Stampin’ Spritzer. I spritzed on enough to saturate the ink but not so much that it took a long time to dry. When it was dry enough, I wrapped the Linen Thread around the front and back of the leaf several times and adhered it in back several times with Dimensionals and Glue Dots. 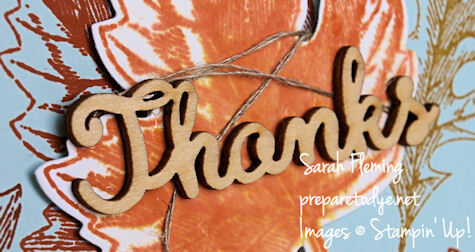 The wooden Thanks is one of the Expressions Natural Elements — I love love love these things! I adhered the Thanks to the leaf with Crystal Effects; Crystal Effects is perfect for heavy embellishments that need something stronger than a Glue Dot. I added more Dimensionals to the back of the leaf and adhered it to the card. And done. Easy peasy. The stamps really do all the work, because each stamp is so beautifully designed that the images don’t need much window dressing. In case you’re wondering, I’m in love with this set (it was the first thing I ordered from the new annual catalog). And it can be bundled with the framelits for 15% off! 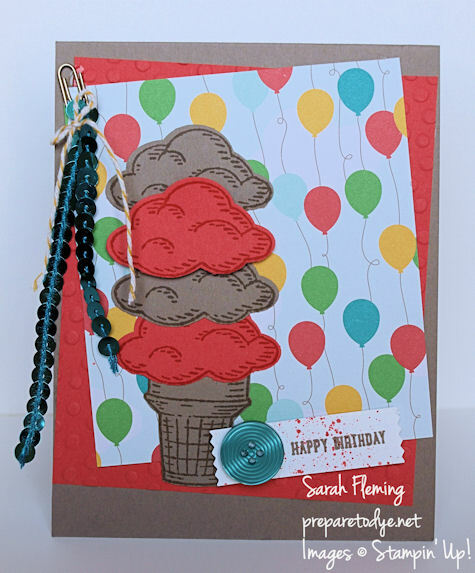 All of the products I used can be bought in my online Stampin’ Up! store (item numbers below for easy searching). I’ve been so excited about this deal ever since Stampin’ Up! told us demos about it. Been counting down the days to August 1st so I could tell y’all about it! Okay, here it is. 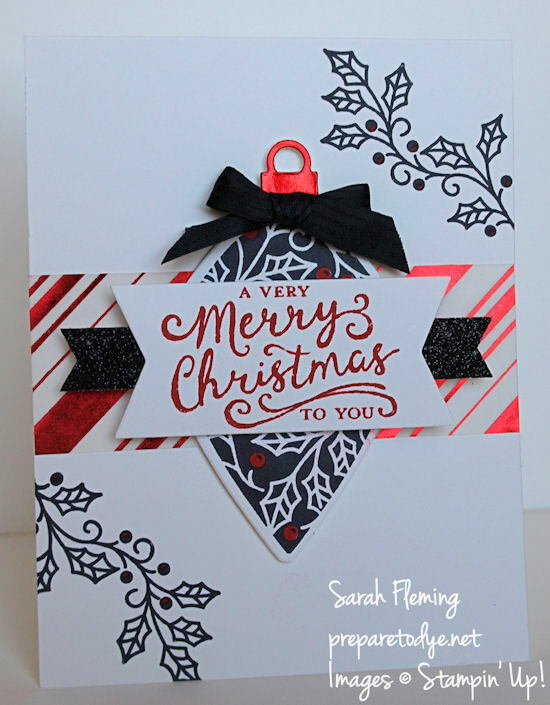 If you buy a Big Shot from Stampin’ Up! in August, you will receive a stamp set and framelits bundle for FREE!!! There are five bundles to choose from, and they’re all great. Great deal, right? I almost wish I didn’t have a Big Shot so I could take advantage of the deal. Oh, but — BUT!! If you already own a Big Shot, you can buy any of the five bundles at 15% off the regular price. Which means that this morning I ordered the Bright & Beautiful bundle, which includes my favorite stamp set from the holiday catalog (going live August 28) and the Stars framelits. You might be wondering why you need a Big Shot. Or even what a Big Shot is. Well, Stampin’ Up! has put together this nifty video to show you the Big Shot Basics. I personally couldn’t live without my Big Shot. Yes, that’s hyperbole when you consider all of life, but when we’re talking stamping, I must have it. It embosses using our wonderful embossing folders. It cuts using framelits dies or steel rule dies. See the chevrons on the black starburst layer? Embossed with the Big Shot, then cut with the Big Shot. The zig-zag border on the Crushed Curry layer is also ct with the Big Shot. The banner is cut with the Big Shot. This whole card is Big Shot, Big Shot, Big Shot. So yeah… must have it. You can cut so many things with the Big Shot. Paper (one layer with framelits, up to four layers of our thick cardstock with the Bigz steel rule dies), fabric, cork, chipboard, coaster board, Glimmer Paper, Project Life cards, the list goes on.